The Buddhas of Bamiyan were two giant Buddha statues carved into a cliff in central Afghanistan. In 2001, Afghanistan’s Taliban government destroyed the statues because they were un-Islamic. But their destruction has led to a number of new discoveries. 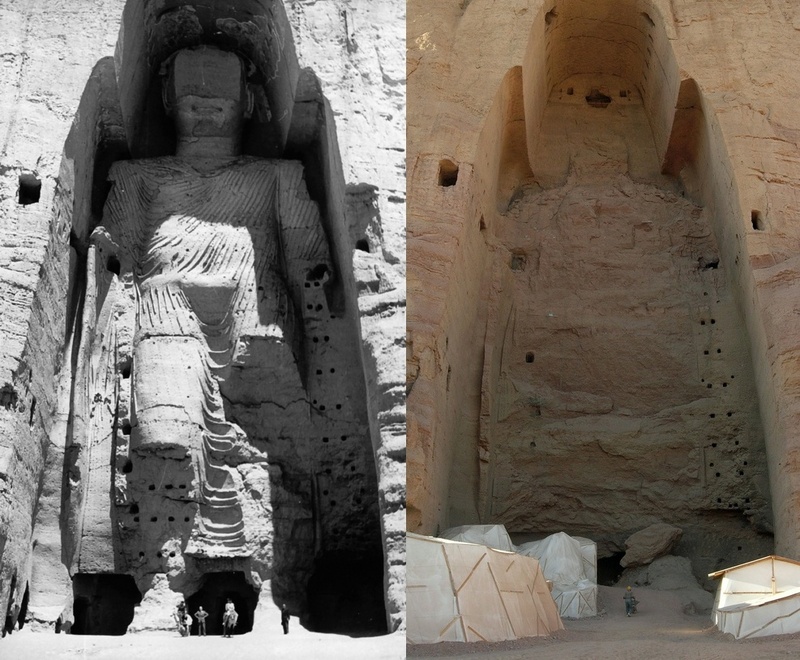 Before the Buddhas of Bamiyan were destroyed, they were the largest standing Buddha carvings in the world. One statue was 115 feet tall, the other was 174 feet tall. The statues were carved into a sandstone cliff in the 5th century. From the 2nd century until the Islamic invasion in the 7th century, Bamiyan was a thriving Buddhist center and was home to several monasteries. It was also part of the Silk Road. They held annual celebrations there that attracted many pilgrims and people would make offerings to the statues. While the main bodies of the statues were carved directly from the cliff, the statues also had details modeled in a coating made from mud, straw, and stucco. But this coating wore away long ago. The statues had a series of holes that were used to stabilize the stucco with wooden pegs. In 1999, after the Taliban had taken control of the area, they said they would protect the statues. But in 2001, the Taliban decided to destroy them. Some say it was a way to protest money going to maintain the statues, others say it was because the statues were un-Islamic. At first, Mullah Mohammed Omar said the statues wouldn’t be destroyed as idols because there was no longer a Buddhist population in Afghanistan and the statues weren’t being worshipped. He also said the statues attracted international visitors which provided a source of income for Afghanistan. But as radical clerics cracked down on un-Islamic parts of Afghan society, the Taliban changed its stance. In an interview, Mullah Omar said the statues would be destroyed to protest international aid that went to maintaining the statues while Afghanis were starving. A Taliban ambassador said “When the Afghan head council asked them to provide the money to feed the children instead of fixing the statues, they refused and said, ‘No, the money is just for the statues, not for the children’. Herein, they made the decision to destroy the statues.” But other Taliban representatives said the statues were going to be destroyed simply because they were un-Islamic. Also, critics have pointed out that if the Taliban was concerned with feeding the children, they could have accepted money offered by a museum to save the statues. After the Taliban announced its plan to destroy the statues, there was an outcry from the international community. Countries including India, Pakistan, Saudi Arabia, and the United Arab Emirates protested their destruction. Japan offered several solutions to save the statues including covering them from view, paying the Afghan government money, or moving the statues to Japan. Many Afghans were also against the destruction of the statues. In March of 2001, the destruction began with the Taliban firing anti-aircraft guns and artillery at the statues. The artillery fire damaged the statues severely but didn’t destroy them. Next, the Taliban put anti-tank mines at the bottom of the statues, so that as rocks fell from artillery fire they would set off the mines. But to fully destroy the statues, the Taliban had to lower men down the face of the cliff so they could plant dynamite into holes in the statues. The destruction of the statues revealed 50 caves behind them, and the caves contained a number of important discoveries including the world’s oldest oil paintings. The caves had been used as homes for monks. In the caves, scientists found oil paintings. They are the oldest oil paintings ever discovered, and they date from hundreds of years before oil paint was used in Europe. Another important discovery found in the caves was a translation of the original Sanskrit Pratītyasamutpāda Sutra. This is a document that spells out the basic beliefs of Buddhism. It was written on birch bark. It’s the first time a sutra was found inside an Afghan Buddha statue. Archaeologists also found a clay seal and a small metal plate that were decorated with a snake, a bird-like creature, and a flower-like pattern. Experts say that the symbols may represent a specific group that sponsored the construction of the giant statues. In 2008, archaeologist also unearthed a 62-foot reclining Buddha statue nearby. But they are still searching for another legendary giant Buddha statue they believe is at the site. This giant statue was written about in ancient records, and it is supposedly 300 meters in size. Since the statues’ destruction, several countries and organizations have pledged to help rebuild them. Work has begun on restoring them using original elements combined with modern material.